I have chosen to stand by the side of my partner who through no choice of his own is afflicted by mental illness. It goes with out saying, that this affliction plays a major role in my life both individually and in relationship. Today is another particularly difficult day for us. Fortunately, my partner was smart enough to remove himself from our home as he had the awareness that should he have stayed he would have hurt me physically. By sharing this type of information openly in forums such as this blog, the result from making the decision to stay in this relationship alienates me from key persons I would normally choose to have in my support network. As a result of my openness and honesty, I have sacrificed both family connections and close friendships. Contrary to what some individuals may think, I have given considerable thought to my decision, consulting with both paraprofessionals and professionals in the field of psychiatry. It is a lonely experience trying to share the struggles my partner and I face to some in our support network, and some have abandoned us altogether. I am asked so often,” Why do you stay with such a person?” At this very moment I find myself asking myself that very same question. I am learning to live with the decisions I make, and am exploring my options. Initially, like it feels right now, thoughts, feelings and emotions are jumbled up inside my head. I feel as though I'm hanging onto a very thin rope over a very deep abyss. I know that it is in times like this that I must first take care of myself. That means starting with the simple things: eating, staying hydrated, taking my own medications, and getting plenty of rest. I'm disadvantaged by not having anyone I can think of to call and talk to right now. I could call my sister, but in my mind, I make up that she and her partner would work to get me out of the apartment and away from Christopher altogether. Why do I feel fear and anxiety around that concept? I would experience hurt feelings for not being here for my partner, I also feel that if either one of us should need to leave our home, it should be the person with the most issues. The Paranoid Personality (PP) can vacillate between being warm, concerned, loving and attentive to being abusive, suspicious, projecting, accusing, blaming, critical, demanding, belittling and downright cruel. The warmth and concern of a PP cannot counterbalance the damage and hurt that can be inflicted upon significant others. Long term intimates including me readily report that the damage inflicted by the PP is so horrendous that it is almost impossible to recover from it without shedding enormous amount of pain. The jealousy of the Paranoid Personality is so intense that he denies the true person hood of the partner. Distrust is combined with intense need and dependency, while the person's blaming, attacking and verbal rage drives the partner into a self-protective world of self-denial, "you" statements and intellectualizing. The PP is an angry person whose rage is destructive to him and others. Paranoid Personalities are hypersensitive to any hint of hurt, betrayal, rejection or attack. There is no awareness that they may actually set up or manipulate others into accidental hurt or rejection. Persecution is seen even where it does not exist. Normal events are perceived as harmful. Negatively narcissistic, PPs believes that somehow they are the object of people's dislike. There will also be job problems, especially when Paranoid Personalities work with authority figures that are perceived as being antagonistic. Perceptual distortions will cause innocuous, harmless events to be seen as threatening to ones very being. At one time in the PP's life, there might have been a paranoid schizophrenic episode. Perceived threats to the person's well being may have produced critical, punitive, auditory hallucinations and delusions of persecution. Such acute episodes may precipitate or be part of the ongoing chronic personality structure of the Paranoid Personality. For my partner, he hears a number of voices which have been with him for a long time; since he was a small child and dealing with hurts never imagined to be waged upon an innocent child. The Paranoid Personality may appear to behave in strange, unusual, deviant, peculiar ways. Thinking can be very idiosyncratic and filled with defensive logic. The PP may appear to be hostile, stubborn, resistant, defensive and manipulative. He will give peculiar reasons for being constantly late for meetings or appointments or for not showing up at all. Even when people he deems to be in his closest inner circle or family are involved. Many promises are broken. The PP tends to influence others with intense, biting anger and may show deficits in consistently expressing love and affection. 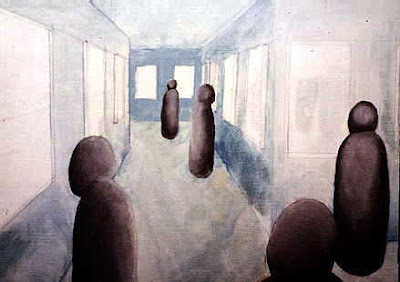 According to Other (1989), the paranoid personality is triggered by close interpersonal relations where the perception is "people sneak up on me and harm me". This sneaky form of harm does not only stem from physical injury, but also from emotional trauma. There is guarded distance, debilitating self-protectiveness, secretiveness, devious and dishonest behavior, scheming and counter-attacking. The person appears suspicious, distrustful, jealous, angry, hostile, negative and hyper vigilant. Paranoid people are very hurt individuals who require enormous amounts of empathy and understanding. Unfortunately, it is difficult for other people to supply that empathy if they are the targets of the paranoids exaggerated responses to minor slights, benign remarks and insignificant events. The PP assigns hidden, hurtful, damaging meanings to objectively harmless situations and events (DSM-III-R, 1989). The internal injuries are so enormous that the PP feels harmed and exploited without a sufficient reality basis. The internal destroyer/annihilator creates the pain and the havoc, but the ego will not take responsibility for the injury to the fragile, vulnerable self. Thus, the inner object finds and locates an external object upon which to blame, accuse and project. In my world that external object is me. Only me. It is important to note that not all people are made into bad, harmful objects by the paranoid person. Some individuals are deemed trustworthy by the inner arbitrator. But sooner or later even trusted others will inadvertently trigger off the internal domain of persecution and harmfulness. Because the paranoid person feels harmed by others, faulty logic, misinterpretation and perception are not apparent to the sufferer. Ones feelings justify ones accusations and suspicious questioning. The paranoid is convinced that his feelings are sufficient basis for accusing others of harm. Here and now reality is intruded upon by earlier unexpressed pain and only by careful processing can the PP learn to correct paranoid interpretations. It is important to remember that it is not the paranoid person's feelings that are distorted. The feelings are legitimate. It is the cognitive processing that is disturbed. Repression causes faulty information processing and the paranoid person suffers a serious break with reality. This questionnaire can help you to identify those characteristics associated with Paranoid Inter-Personality problems. 1. Do you believe that your partner or friend has a hidden, excessive fear of being abused, hurt and emotionally injured? 2. Does your partner or friend appear to engage in unreasonable scanning and hyper vigilant behaviors? 3. Have you noticed that your partner or friend appears to engage in projection, ascribing malevolent intentions, actions and motives to you and other people? 4. Have you ever been the object or target of your partner or friend's fear, anger and distrust? 5. Does your partner or friend seem to be negatively hypercritical? 6. Does your partner or friend appear to be negatively and disrespectfully judgmental? 7. Do you sometimes feel that you are a symbolic representation of someone or something out of your partner or friend's past? 8. Do you sometimes feel that your partner or friend displaces, externalizes feelings on to you that seem to belong onto someone else from the past? 9. Do you sometimes feel that you are a bad parent to a child with PPD? 10. Do you sometimes feel that you are being treated as if you are an abusing parent? 11. Do you sometimes feel that you are being accused unfairly? 12. Do you sometimes feel that your partner or friend plays the victim and you are the victimized? 13. Do you sometimes feel that your partner or friend identifies with abused children and sees you as the bad parent? 14. Do you sometimes feel that your partner or friend magnifies and exaggerates events and behavior? 15. Do you sometimes feel that your partner or friend misinterprets events and people's behavior and motives? 16. Does your partner or friend promote dispersive benign events and mislabel them as, "Terrible, Awful, etc."? 17. Does it seem that your partner or friend turns reality around into the opposite direction? 18. Does it seem that your partner or friend presents a positive image and then turns around into the opposite? 19. When you spend time with your partner or friend, do you feel disordered after wards? 20. After you have spent time with your partner or friend, do you feel like crying and screaming? 22. Have you ever been emotionally involved with a suspicious and distrusting person before? 23. Does your partner or friend hold grudges? Is there a family history of grudge holding? 24. Does your partner or friend keep reminding you of the skeletons in your family closet, but never talks about his/her own? 25. Does your partner or friend seem more negative than positive, most of the time? 26. Are you afraid to end the relationship with your partner or friend? 28. Does your partner or friend convince other people [including therapists] that you are the bad one? 29. How does that make you feel? 30. Does your partner or friend make conclusions based on insufficient, arbitrary, unsubstantiated evidence? 31. Does your partner or friend select certain information out of context and highlight certain details while ignoring other important information? 32. Does your partner or friend engage in polarized, all or none dichotomies thinking [good, bad, black, white, etc.]? 33. Does your partner or friend display tunnel vision; i.e., seeing only what he/she wants to see? 34. Does your partner or friend make automatic assumptions that you hold a negative ulterior motive for your actions? This is the commitment I am making to myself and to my partner to keep us both safe, healthy, and in this relationship for the long tern. Christopher will never have to go through this process alone, nor will I. This is the message I must hear. I now feel that I understand the problem. Now it is time to devise a solution. There is no question, whether I love Christopher or not. Not in my mind. I understand that there is in his mind. But as for me, the relationship is not on the table. I ask for greater attempts by him to be honest with me. The cloud of dishonesty which enshrouds our relationship makes it impossible for me to know what truths I really have to work with. But the coping mechanisms I have put together below the commitment I have made to myself and to Christopher and it is sealed with a kiss and filled with the utmost love. Take care of you emotionally, physically, spiritually, inter personally and financially. Acknowledge your own hurt and pain. Each one of the preceding categories is like a bank account, that you either invest in or that you withdraw resources. For example, your Physical Account, also known as a Health Account, is subject to deposits made of healthy exercise, good sleep hygiene, disciplined eating habits and other behaviors that build up and expand your Health Account. Any behavior that lessens your Health Account can be seen as bank withdrawals, which can eventually lead to physical deterioration, health problems, shortened lifespan and physical bankruptcy. Remember, your life and your present circumstances are your responsibility and your creation. You have choices! You can either choose to make deposits and expand the above Bank Accounts or you can withdraw your assets. If you don’t take care of yourself emotionally, spiritually, inter personally and financially, you will experience the depletion of those various accounts. In this book, you will also come across the concept of the Love Bank, which also uses the metaphor of bank deposits and withdrawals. Practice non-reactivity. Do not react! [a] If after an unpleasant experience, you are left with unpleasant feelings, go to a private place and purge/cleanse those feelings. I recommend the deep feeling, primal integration method. This includes free association, deep breathing, and the willingness to cry and scream out the pain. Prayer also helps. You can also set up a therapeutic situation, in your sanctuary, where you can role play what it is you would like to say and express to that particular person. Going to a therapist can also be a great help by allowing you to talk out, express and purge your disturbed thoughts and feelings. A therapist can teach you various cognitive and emotional tools for relieving the distress that reactivity can cause. I also have a prescription for Kingpin which re dices anxiety. I must remember to take this medication before the actuarial “flare up”. [b] When you anticipate being in a difficult, unpleasant situation, decide ahead of time, not to react emotionally to it, in your usual reactive way. Choose to take an observing position, where you deliberately choose not to react and instead observe the situation from an objective position. This requires that you do not deny your internal responses, but instead, choose a more preferable, non-reactive, calm way of thinking, feeling and dealing with it. This approach allows you to stay in control, by you choosing how you wish to think, feel and respond. The non-reactive solution too many difficult interpersonal situations, assumes that you will take a more observant, less reactive, more thoughtful approach to recognizable, anticipated difficult situations. You do not have to add fire to an already inflamed and intense situation. You can take a calm, measured, thoughtful approach by you choosing to deliberately monitor your internal reactions and replacing your habitual responses with calm, observable, objective responses. Just remember, that if you are still disturbed after leaving a negative interaction, you can go home and work your way through your disordered feelings with tools that are learn able, such as cognitive restructuring, journal work, role-playing, anger dissipation by punching pillows, verbally ventilating and various reactive, cathartic, deep feeling pain release methods. [c] Evaluate your situation to see if you are emotionally, intellectually and inter personally over-involved. Sometimes when you are over-involved in a difficult situation, you cannot see it clearly and creating distance may lessen your over-involvement. I am not saying that you should not be involved in potentially difficult situations; I am saying that if you recognize that you are over-involved, you may wish to make a decision to lessening your involvement to a more manageable level. Remember, that over-involvement can lead to excess of stress and overwhelming negative feelings. Lessening your involvement can help you to restore your sense of balance and equilibrium. Get to know and learn to control your own anger, resentments and pain. Get to the bottom line of your anger, so that there is no anger left for reacting to the disorder. A punching bag and an aluminum baseball bat work well together for anger work. Punching and screaming into a pillow works wonders. Most situations that produce anger usually reflect the absence of Empathy in either one or both participants. Some people do not adequately test their perceptions and usually makes statements through a particular lens or filter. The result is that some kind of malignant or disrespectful judgment is made and the other person usually uses anger to fend off the attack. Empathy requires that you be able to put yourself inside of the shoes and the skin of another person in order to feel and experience what they are going through. Your anger might be the result of someone Else’s insensitivity and lack of empathy. If you react with anger, you will probably make the situation worst. Therefore, learn to control and discipline your instinct for anger. No matter what anyone says or does, if you use anger as a negotiation tool, it may backfire on you. Difficult people are all around you and they make assumptions and perceptions based on poor reality testing for validity and reliability. Focus on the desire and ability to be open, honest and clear. The goal of anger work is not the anger itself. The goal is to get the anger out of the way so that you can become clear while getting to the pain and hurt that is underneath. Do not listen to people who say that such anger work only reinforces the anger. These people do not understand the purpose and dynamics involved in deep anger/pain work. You can tell this by the way they structure their thinking and their ideas. Understand that the process and benefits of working the anger is so you can get to your bottom line emotional truth, which will free you from unnecessary and counterproductive expressions of anger. Anger as a relationship negotiation tool, usually does not work and causes pain and hurt. People who use anger as a relationship negotiation tool need to find a more effective strategy for problem solving and negotiation. Fighting does not work and eventually will create withdrawals from the relationship Love Bank. In all serious relationships, I recommend the implementation of the policy of Enthusiastic Mutual Agreement. This policy requires that no decision be made until both parties enthusiastically agree to an effective strategy. Be aware that you are the object of projections; engage in empathic reflection and paraphrasing. Observe and steer conversations in your direction without appearing to be controlling or manipulative. Do not use force or power tactics. Many people get caught in a War of Perceptions. Remember, that perceptions are not reality. Some perceptions come from a person’s belief system and are just thrown out without adequately testing for validity and reliability. Most people also mistakenly believe that their perceptions are reality and will fight you to the death in order to defend their perceptions. Refuse to get trapped in a War of Perceptions. Perceptions are usually formed through a specific lens or filter. You can pretty much figure out what that filter is, while recognizing that most perceptions are nothing but opinions. If you want to avoid a war of perceptions, keep your opinions and your perceptions to yourself until someone asks for them. In your thinking and in your conversations, do not be tempted to make someone, including yourself, into a bad person, a so-called Mr. /Mrs. Hyde. Troublesome people ineffectually spatter their conversations with disrespectful and malignant judgments. When you open your mouth, in front of these people, you are potentially subjecting yourself to being hit by a negative judgment. Don’t argue or try to convince that person of the errors in their judgments. Don’t even try to convince them to change their judgments about you, no matter how hurtful they can be. This type of person is usually awash in self-righteous, rigid thinking while being totally convinced of their own innocence and your guilty bad ways. They can never do any wrong and usually behave like a “goody two shoes.” Notice how they squiggle at anything off-color. This is usually their attempt to devalue your motives and elevate themselves. They are probably very jealous of you and fear your superiority and your love of life. In a sense, it is your ability to have fun and enjoy yourself that irks these people, the most. Align and involve yourself with people who share the same love of life, fun loving and sense of humor as you. Get your needs for acceptance satisfied elsewhere. This is a harsh reality, but one that you must internalize and believe with all of your heart and soul. The paranoid personality disordered person has very little or no affectionate feelings toward you, don’t try to change that. You will only reinforce their lack of positive feelings. Accept that you have been symbolically rejected. Remember, this is symbolic and not very rational or real. The more you react, rather than respond, the more you will reinforce and reward disordered behavior. If you have caused pain or hurt to a significant other, admit it and vow that you will stop doing the offending behavior. This can be reinforced by assuring the other person that you will do everything in your power to remove your offending behavior. By engaging in more positive behaviors, you may be able to be in a position of depositing love units into the other person’s Love Bank. Try to recognize when you are being set up to play the role of a rejecter, abandoner and annihilator. If you go along with the disordered person’s symbolic needs, you will unconsciously be regarded as a good object parent. If you go against the person’s needs and desires, you will be seen unconsciously, as the bad parent object. Don’t argue or try to change the other person’s opinion or perceptions. Simply engage in more loving and supportive behavior, while eliminating love withdrawals. If the other person’s perceptions seem very far-fetched, wait for the right time to discuss your valid opinions and views of the situation. Do it in a very calm, warm manner based on the assumption that the other person wants a more productive relationship with you. Do not blame or accuse. This is not a contest to see who wins. This is about finding effective strategies for recovering what was once lost and might be found again. Do not engage in interpersonal politicking and diplomacy. Do not reject outright. If you put yourself in a conflict situation, organize it so that you get something out of it. For example, if the person invites you to a special occasion and you harbor resistance to attending, re frame the situation in your mind so that you glean some reward for attending. Remember, most if not all invitations by the disordered person can be seen as setups for mutual rejection and distancing. Back in the 1970s, people had to learn how to say, “No.” You may also have to find a way to say, “Yes … this is the age of Political Correctness and its counterculture Hip Hop reaction. No matter how you feel about these two polar opposite trends, they both exert social pressure. So make it OK to consciously seek fulfillment and accomplishment in every situation that you find your self. You cannot avoid all situations. So make up your mind that where ever you find yourself, you are going to create a golden opportunity where none seemed to exist. Turn minuses into pluses! Know very well how to restructure your thinking. The most pliable and flexible organ of your body is your mind and your thinking processes. Believe that you can shape and mold your thinking and your ideas into more fulfilling, positive and productive outcomes. Picture your mind as a shapeless, formless lump of clay, just waiting for you to turn nothing into something, negativity into productivity and creativity. Observe and watch your mind and your thinking processes. Activate your observing ego into changing and shaping the very nature of thought it self. Then watch the results of what you have reshaped and created in the Paradise of your mind. An alert and observant mind is your best hedge against being pulled into the characteristics of the disorder. Take inventory of what you are unconsciously doing to reinforce the difficult person’s behavior. An alert and observant mind is your best hedge against being pulled into the characteristics of the disorder. Abandonment may be a big issue with some disorders while narcissistic injury and deflation of the ego could be problems for other disorders. Once you have acknowledged your contribution to any difficult situation, work very hard at eliminating all of your ineffective strategies and discover ways to be more effective. Keep a Daily Planner that allows you keep track of what ineffective strategies you are trying to eradicate and the effective strategies that you are intending to implement. Get a coach, someone who already possesses the skills that you wish to acquire. Great achievements are usually accomplished by imitating the successful activities of those people who are already doing what you want to do. I have spent nearly eight hours on the research and writing of this blog today. This has come up as part of Christopher’s anger profile toward me. But I stand firm by its effectiveness. I now have created a quick reference guide for myself, which includes certain courses of right action to keep me safe. I have made this public so that those in my inner circle can see that I have essentially made a contract with myself for safety, and explaining the love I feel for Christopher. Finally, if this helps just one other couple that may be experiencing similar challenges as those faced by Christopher and me, then I will feel as though I have been able to give something back to the community.